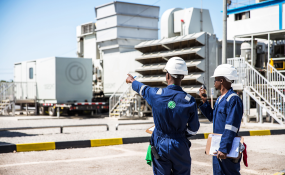 One of Africa's major energy and transportation firms - Aenergy - has become the continent's first business to be recognised by Bureau Veritas for its outstanding work practices. Angola-based Aenergy, which operates the country's largest thermal power plant and provides locomotive engines for the nation's railways, has been awarded the Anti-Bribery Management System Certificate. "This certification demonstrates the ethical values and the forward-looking strategy pursued by Aenergy in all activities in Africa with the goals to be an innovative leader in renewable energy and climate finance, to deliver a better life and generate jobs to the African people across the entire continent," said Ricardo Machado, chairman of Aenergy. Copyright © 2019 Aenergy. All rights reserved. Distributed by AllAfrica Global Media (allAfrica.com).